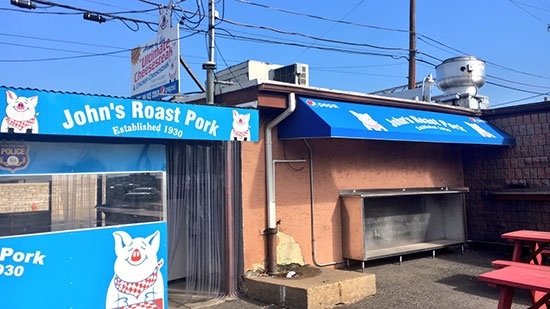 An overnight burglary at John's Roast Pork on Snyder Avenue in South Philly forced the sandwich shop to close on Friday. The burglars made off with thousands in cash from a box and $1,500 in donations set aside for a charity. They also tried to break into the ATM machine but failed, but they did take the DVR for the video surveillance system. The break-in happened around 3 a.m. Owner John Bucci said that the thieves broke the lock on the exhaust fan on the roof, removed the motor, and shimmied down 8-10 feet through the exhaust duct into the store. The ventilation will have to be repaired before the shop can reopen. The charity money was supposed to go to Be The Match, an organization that matches cancer patients with potential bone marrow donors. Bucci himself received a transplant for leukemia about 10 years ago. Two area businesses stepped up today to replace that lost charity money. Both Frank Olivieri, the owner of Pat’s Cheesesteaks, and Adam Spivak, co-owner of the Electric Factory, each gave $1,500, doubling the original donation. An Uber driver has been arrested for allegedly robbing the homes of passengers in Delaware. 26-year-old Saddam A. Awadallah of Frankford would pick up passengers at their home in the Bethany Beach and Fenwick Island areas and transport them to local area businesses and restaurants in the Ocean City and Dewey Beach areas. While they were away he would return to the residences and steal items such as credit cards, computers, watches, cell phones, tablets, and sunglasses. Awadallah was caught in Tennessee and extradited back on February 13th. He is charged with three counts of burglary 2nd degree, possession of burglar tools, theft with a victim 62 years of age or older, 11 counts of theft, and criminal mischief. He is being held on $31,000 secured bond at Sussex Correctional Institution. Two brothers were shot and killed outside a home in East Mt. Airy last night. It happened around 10:30 p.m. on the 300 block of Upsal Street. Police arrived to find the two lying in a driveway suffering multiple gunshot wounds to the chest and torso. They have been identified as 24-year-old Raheem Martin and 23-year-old Symir Yelverton. The were transported to Einstein Medical Center where they died a short time later. The two brothers had just moved back home with family. Apparently the gunfire erupted after an argument on the street corner. Police are trying to determine a motive and identify any suspects. This afternoon, Sunny, temperatures around 40 in Center City.